This funny book is set on a farm. But where is the farmer? He’s so lazy he lies in bed all day. He bullies poor Duck into doing all the work, and doesn’t care how tired Duck gets. The other farm animals think it’s very unfair. Then one day, Duck collapses in tears. So the others decide to strike back. Watch out, Farmer! Such a classic: wonderful pictures from Helen Oxenbury, combined with a touching story about kindness and standing up for your friends. This is a amazing timeless story. I recommend this book to every young reader. My favourite bit in the book is when the animals get there own back on the farmer. I would recommend this book to 3-5 year olds for their parents to read it to them. 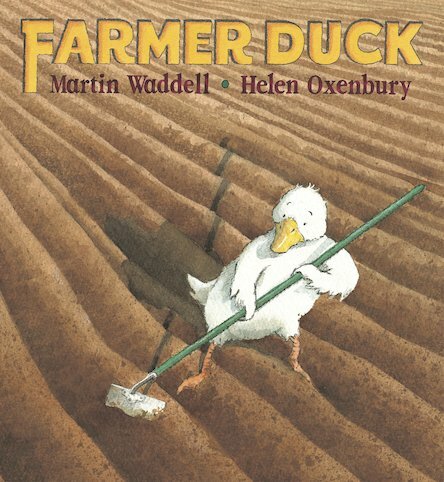 when reading this in class when i was small i felt really sorry for the little duck having to work all day long! The author has clearly showed the readers what sharing is about and hardwork. I read this when I was in P2 so if you are 7 or under you will really like it. but it really bugs me!!!!! This is a total classic that I read with all my siblings, and it is engaging and fun. i read this book with my brother and it is very good for little kids.